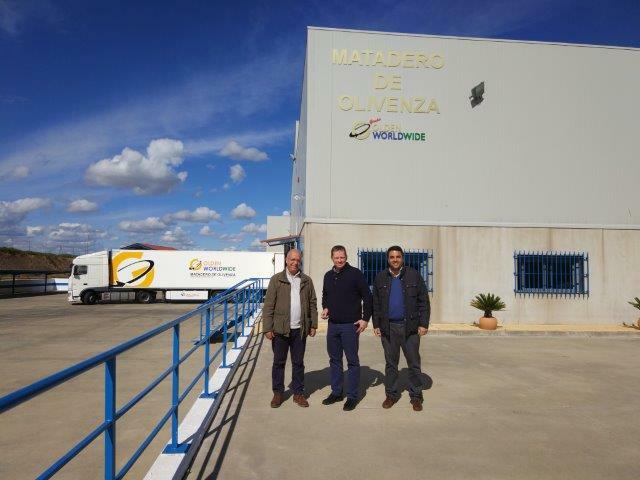 On Friday March 24th we visited the Olivenza slaughtering plant. The owner Ahmad Al-Kathib is working on a very ambitious integrated project of farm production with extensive livestock. He took over the Olivenza slaughtering plant a few years ago and turned it into a state-of-the-art plant with all the necessary certifications like Organic, Halal, IFS, BRC among others. We visited the plant and several plots near the area of Badajoz city. Ahmad and his group control about 2000 hectares of farmland in Extremadura including traditional Dehesa and also irrigated land. The group has a clear preference for agroecology since this fits better with the requirements of their customers in Europe and the Middle East and also with the search to be a sustainable producer of high quality product with complete traceability and transparency. We are all convinced that the future meat consumer demands more guarantees than ever after the latest scandals. Ahmad Al-Kathib and his newly appointed plant director Bernardino Píriz Antón accepted with pleasure the invitation to attend the Life Operation CO2 final conference on the 17th of May in Palencia. They look forward to hear about the results of the project on the soil improvements after implementing agroforestry practices in two demostration areas characterized for beeing located in drylands as well as implementing integral forestry management in a natural area.